Featured Book: Hauth, Katherine B. 2011. What's for Dinner? : Quirky, Squirmy Poems from the Animal World. Ill. by David Clark. Massachusetts: Charlesbridge Publishing, Inc. ISBN-13: 978-1570914713. 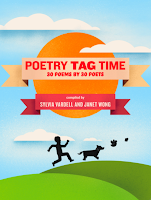 I hope you'll also allow me to plug my new book again, PoetryTagTime, an e-book with 30 poems, by 30 poets, all connected and downloadable right now at Amazon for your Kindle or Kindle app for your computer, iPad or phone. Just 99 cents. Don’t miss it. This co llection of 30 new, unpublished connected poems range from the humorous to serious, about tongues, turtles and toenails, in acrostics, quatrains, and free verse written by 30 of our best children's poets. And the “connections” between poems as the poets voice how their poems are interconnected in this game of poetry tag adds another layer of fun and meaning. You'll be able to share brand-new poems and poetry tips with children all month long for pennies a day! Even if you don’t own a Kindle, you can download the free Kindle app for a number of devices, including your Windows or Apple computer, iPad, iPhone, BlackBerry, or Android-powered phone. Put the poems on your cell phone and you're ready with a "poem in your pocket," too! Also, be sure to check out our web site (PoetryTagTime.com) and companion blog (PoetryTagTime.Blogspot) for strategies for sharing each of the 30 poems in the book, rolling out one per day throughout the month of April. And don't forget to join the fun at the Poetry Friday gathering at Madigan Reads! know how well I think she captured the theme. I especially like the way she used the sloth excerpt and moving print, some stretching like taffy. Nice assignment. Thank you for the idea.